In celebration of the 2019 New Year holiday, cities across the country have been decorated with festive lights of various shapes and colors. They also offered residents and visitors activities, demonstrations, and performances throughout the day. The Department of Culture, Sport and Tourism of the central coastal province of Quang Nam held a ceremony welcoming 3.8 millionth visitor to Hoi An ancient town on December 31. 3,000 lanterns, 50 colorful balloons and a fireworks display at Hoi An Impression Theme Park on Hen islet in the Hoai river lighted up the sky of Hoi An. Some open-door activities could not happen due to cold weather, light rain and drizzle. However, many foreign visitors came to Hoi An Impression Theme Park to enjoy art shows, including a special performance describing Hoi An as the busiest commercial port, where connected to the world civilization from the 16th-19th century. In addition, the biggest New Year’s Eve events in Da Nang City are a firework dsiplay along Han river banks and a Countdown Party Concert at 29/3 Square on 2/9 street from 9:00pm until midnight, while the art program “Hello Dalat 2019” attracted thousands of visitors to the resort town. Hanoi is bustling with a wide range of cultural activities during the New Year holiday. Cold weather could not deter thousands of people flocking to the capital’s center to celebrate the New Year. 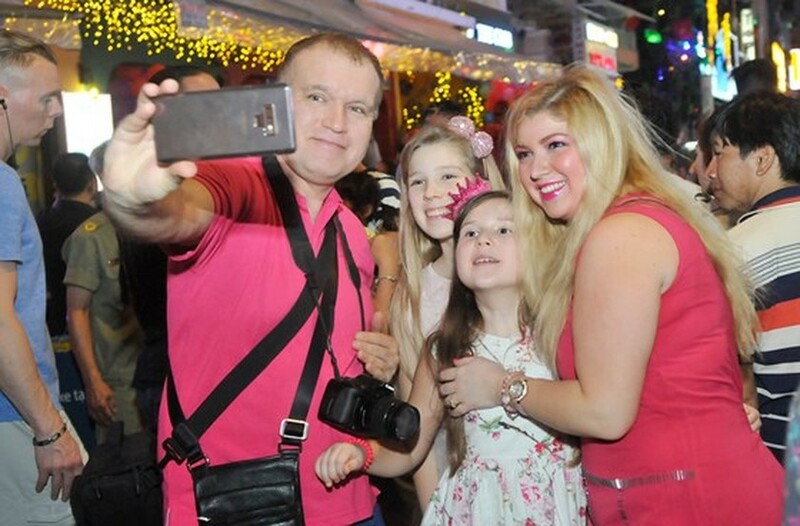 A dazzling New Year countdown party was held at Ly Thai To Statue Square near Hoan Kiem Lake with the participation of famous artists and members of the national football team. Meanwhile, a special art performance featuring leading singers took place at Dong Kinh Nghia Thuc square. A program featuring open-air market in the northern mountainous region which is being held at the Vietnam National Village for Ethnic Culture and Tourism, in the Dong Mo tourism area of Son Tay town, attracted a large number of visitors. Northern mountainous provinces have been covered with snow and frost. The temperature in Lang Son province was measured 0 degrees Celsius. Visitors have flocked to Mau Son tourism zone in Lang Son and Sapa town in Lao Cai province to experience the snow that has fallen. In HCM City, tens thousands of people flocked to main streets to attend assorted activities to say goodbye to 2018. New Year’s Countdown Lights 2019 featuring Vietnamese and international singers and DJs, such as Thanh Bui, Soobin Hoang Son, Trong Hieu, Đen, Bich Ngoc, Osad, Kimmese, Hoaprox, SlimV, The Lyricist, comedian Tran Thanh attracted more than 50,000 audiences. 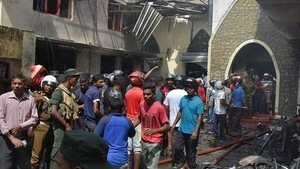 The event began at 8 p.m. on December 31, 2018 and ended at 1a.m. on January 1, 2019. 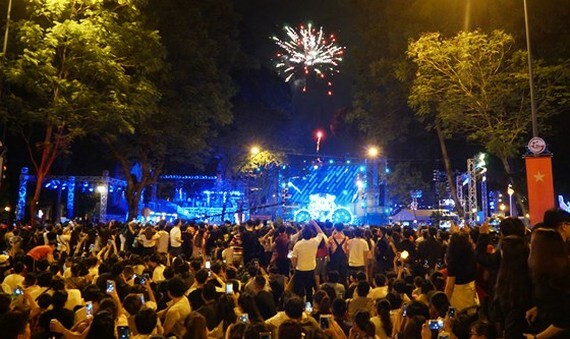 Meanwhile, the Tiger Remix music festival 2019 took place at the intersection of Le Duan and Pasteur streets in District 1 with the participation of pop star My Tam and singers Son Tung MTP, Ung Hoang Phuc, Dong Nhi, Duc Phuc and others. Citizens and visitors also enjoy spectacular firework displays on the New Year’s Eve. A high-range firework display was set off from Thu Thiem tunnel in District 2. Another low-range firework display was organized in Dam Sen Cultural Park in District 11.